Recursive feature elimination (RFE) is a feature selection method that fits a model and removes the weakest feature (or features) until the specified number of features is reached. Features are ranked by the model’s coef_ or feature_importances_ attributes, and by recursively eliminating a small number of features per loop, RFE attempts to eliminate dependencies and collinearity that may exist in the model. RFE requires a specified number of features to keep, however it is often not known in advance how many features are valid. 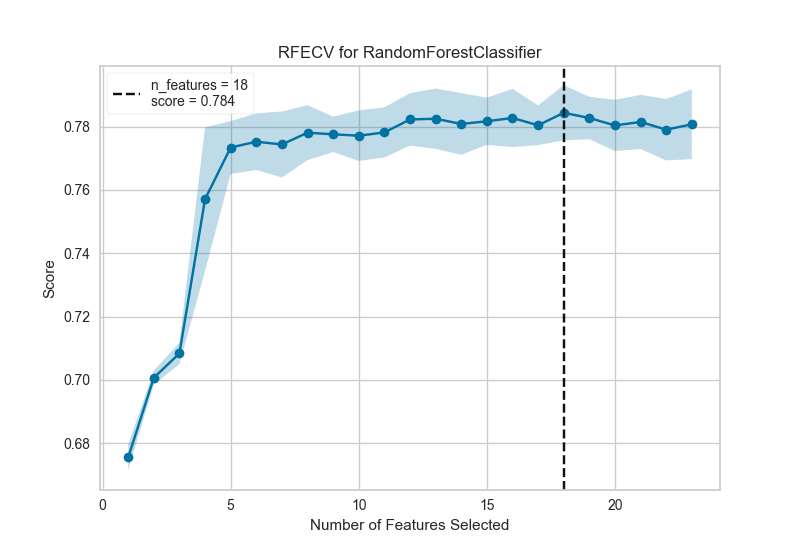 To find the optimal number of features cross-validation is used with RFE to score different feature subsets and select the best scoring collection of features. 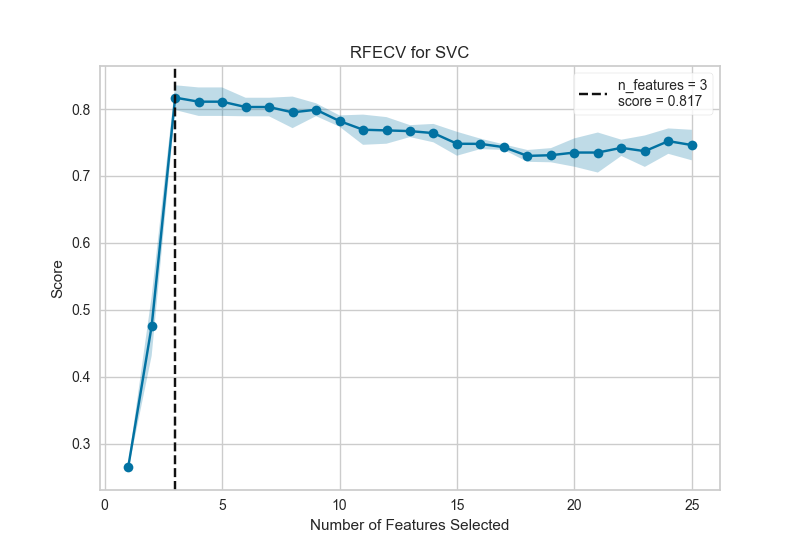 The RFECV visualizer plots the number of features in the model along with their cross-validated test score and variability and visualizes the selected number of features. To show how this works in practice, we’ll start with a contrived example using a dataset that has only 3 informative features out of 25. This figure shows an ideal RFECV curve, the curve jumps to an excellent accuracy when the three informative features are captured, then gradually decreases in accuracy as the non informative features are added into the model. The shaded area represents the variability of cross-validation, one standard deviation above and below the mean accuracy score drawn by the curve. Exploring a real dataset, we can see the impact of RFECV on a credit default binary classifier. In this example we can see that 19 features were selected, though there doesn’t appear to be much improvement in the f1 score of the model after around 5 features. Selection of the features to eliminate plays a large role in determining the outcome of each recursion; modifying the step parameter to eliminate more than one feature at each step may help to eliminate the worst features early, strengthening the remaining features (and can also be used to speed up feature elimination for datasets with a large number of features). This visualizer is is based off of the visualization in the scikit-learn documentation: recursive feature elimination with cross-validation. However, the Yellowbrick version does not use sklearn.feature_selection.RFECV but instead wraps sklearn.feature_selection.RFE models. The fitted model can be accessed on the visualizer using the viz.rfe_estimator_ attribute, and in fact the visualizer acts as the fitted model when using predict() or score(). Recursive Feature Elimination, Cross-Validated (RFECV) feature selection. Selects the best subset of features for the supplied estimator by removing 0 to N features (where N is the number of features) using recursive feature elimination, then selecting the best subset based on the cross-validation score of the model. Recursive feature elimination eliminates n features from a model by fitting the model multiple times and at each step, removing the weakest features, determined by either the coef_ or feature_importances_ attribute of the fitted model. The visualization plots the score relative to each subset and shows trends in feature elimination. If the feature elimination CV score is flat, then potentially there are not enough features in the model. An ideal curve is when the score jumps from low to high as the number of features removed increases, then slowly decreases again from the optimal number of features. An object that implements fit and provides information about the relative importance of features with either a coef_ or feature_importances_ attribute. If greater than or equal to 1, then step corresponds to the (integer) number of features to remove at each iteration. If within (0.0, 1.0), then step corresponds to the percentage (rounded down) of features to remove at each iteration. This model wraps sklearn.feature_selection.RFE and not sklearn.feature_selection.RFECV because access to the internals of the CV and RFE estimators is required for the visualization. The visualizer does take similar arguments, however it does not expose the same internal attributes. Additionally, the RFE model can be accessed via the rfe_estimator_ attribute. Once fitted, the visualizer acts as a wrapper for this estimator and not for the original model passed to the model. This way the visualizer model can be used to make predictions. This visualizer requires a model that has either a coef_ or feature_importances_ attribute when fitted. The feature ranking, such that ranking_[i] corresponds to the ranked position of feature i. Selected features are assigned rank 1. The cross-validation scores for each subset of features and splits in the cross-validation strategy. A fitted RFE estimator wrapping the original estimator. All estimator functions such as predict() and score() are passed through to this estimator (it rewraps the original model). The number of features removed on each iteration of RFE, computed by the number of features in the dataset and the step parameter. Fits the RFECV with the wrapped model to the specified data and draws the rfecv curve with the optimal number of features found. Target relative to X for classification or regression. Returns the instance of the RFECV visualizer.